After all of the excitement with the elephants and tigers yesterday, the only things we had planned for today was the Bangkok Food tour and we had arranged a private guide after that until 5PM. So definitely hoping for a more relaxing day. The food tour started at 10 AM and we had a little bit of a rough start with my reservation getting mixed up with 2 other Jennifers on a couple of different days and a group that arrived right at 10, instead of 9:45. Overall the food tour was good, we started with Roast Duck and the next stop was at a local temple associated with a school. Earl got to ring the “bell” to show that he had been there and paid his respects. The next stop was at a Muslim restaurant, called “Muslim Restaurant” (again, you can’t make this up), where we had an egg with curry sauce. Then we took a ferry across the river to a “very local” restaurant where we had crispy catfish and a spicy pork dish. They even had the fish that they were ready to cook on display. They make crispy catfish by chopping up the catfish into very small pieces, then adding flour and then they deep fry it. It was very good and the sauce that they served with it was good as well and allowed you to spice it as you like. After we crossed back over the river on the ferry, we went to Earl’s favorite stop, where we were served a pork BBQ bun and a sweet stuffed bun. It was really Earl’s favorite since they had Thai iced tea. The final stop on the tour had the best air-conditioning of the whole tour, then we learned that we could be seated outside. 😦 But, this last stop was for a chicken curry with roti and coconut sorbet. 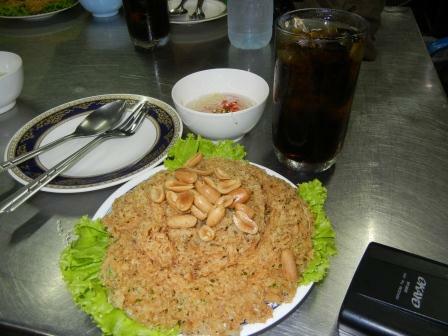 After we had eaten all this it was time to “get cultured” and see the major sights of Bangkok with our guide. We took a boat to the Grand Palace. 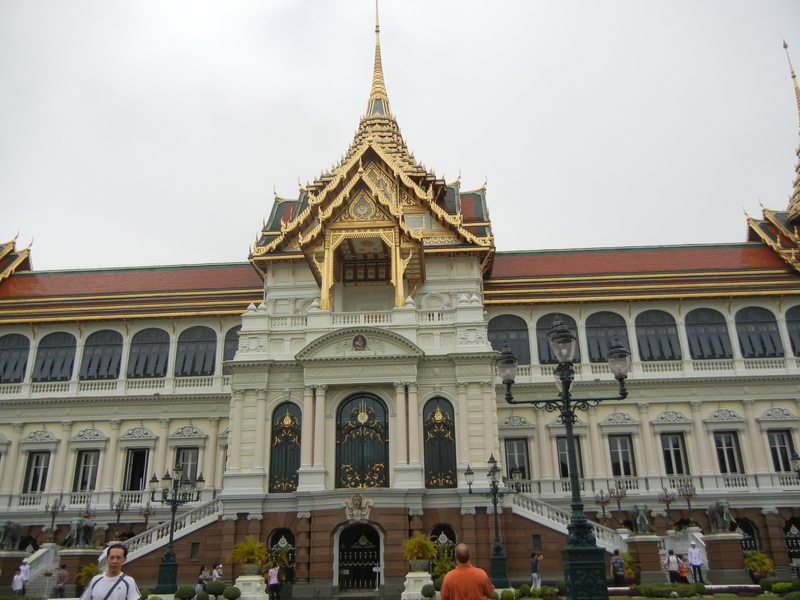 The Grand Palace itself has a very interesting design where the palace appears very Western with a Thai roof as a compromise for this palace looking “too Westernized”. The current Thai king and queen do not live here now, but this was an actual residence for Rama I – V. The current king is Rama IX. 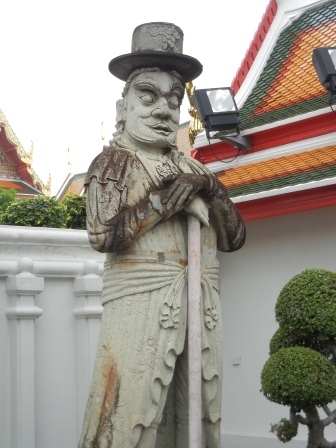 The rest of the Wat Phra Kaew complex includes multiple buildings including the temple for the Emerald Buddha. This Buddha was carved from a single piece of jade and is almost 3ft high and 2 ft wide at its widest point. The legends also say that it was carved in ~43 BC, so it is well over 2,000 years old, so now it holds prominence as one of the most holy relics of Buddhism and a symbol of Thailand’s devotion to Buddhism. Only the King changes the clothes to correspond to the seasons and the highest monks are the only ones who can touch this to clean it. We then took a Tuk Tuk to Wat Pho. 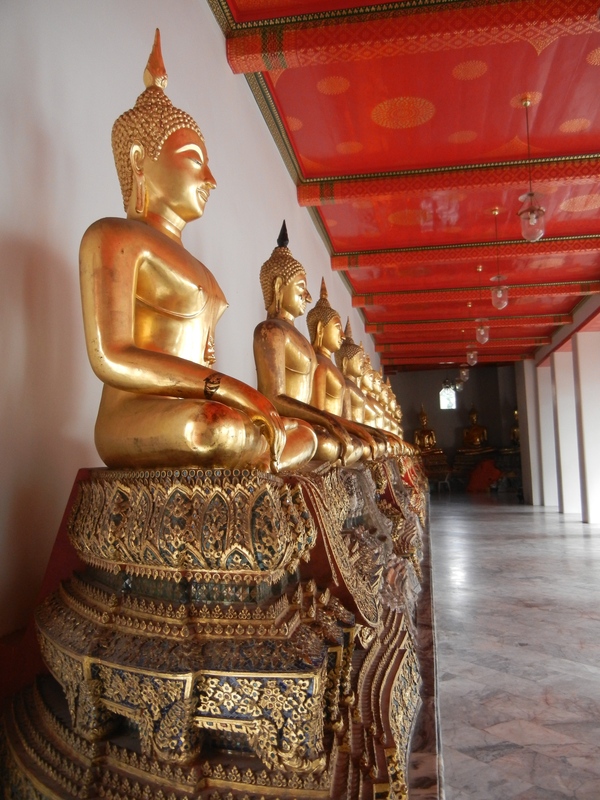 Wat Pho is famous for the Reclining Buddha, but is a beautiful temple complex and still working monastery now. Our guide took us into many of the smaller temples where there are also beautiful Buddha statues. You can definitely see the Chinese, Indonesian and Laotian, Cambodian and even Western influences in Thai culture especially since Rama 1. There are even traditional Chinese statues where they have on top hats. 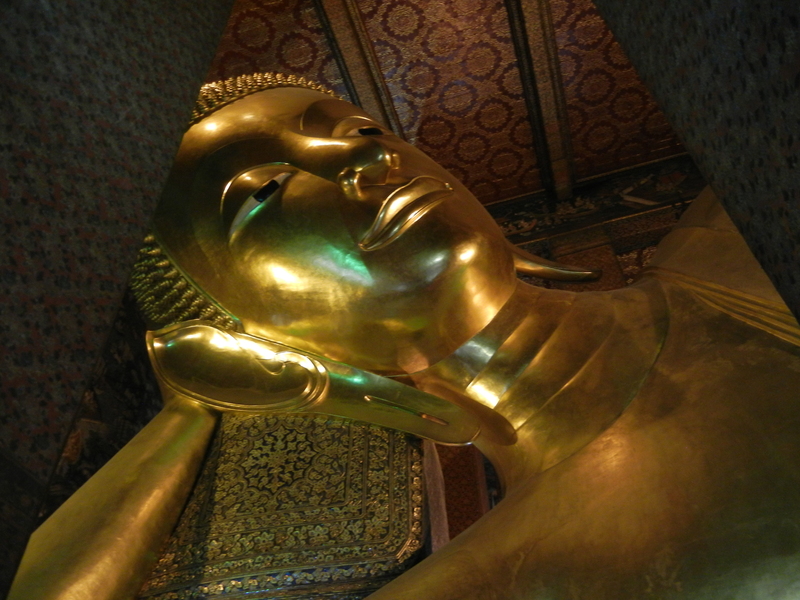 After taking our shoes off for the 6th time today, we finally saw the famous Reclining Buddha. This did not disappoint, it was definitely a huge statue with enormous mother of pearl feet. By this time we were about done with our time with the guide, and we wanted to go ahead and get a taxi back to the hotel. However, as had been our luck the taxi drivers didn’t want to do a metered ride, so we took the tourist boat back to where the public transportation (Sky Train) was and then hatched another plan. 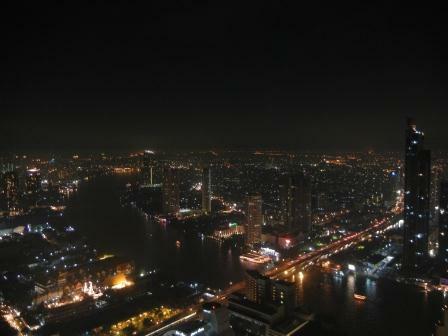 Earl wanted to stop by a camera shop and see if electronics were any cheaper in Thailand (they aren’t), but we went and got a few new memory cards and then decide to splurge and go up to the 63rd floor of the Sky Bar at Lebua and see the sunset. This was apparently made famous in Hangover II, but as neither Earl nor I have seen that movie, will have to take their word for it. We enjoyed great views of the city and the river and watched the sunset. It was a great way to end another busy and packed day. Tomorrow has actually nothing planned, so we may head to some more of the malls or just chill out before we fly to Hong Kong on Monday. Then meet my mom and dad for our tour there on Tuesday. Less than 9 days left in this adventure and I will be sad to see it end, but would like to thank everyone for following us!